If you have a barren, unfertile area in your garden that gets a lot of sun, plant some cosmos from seed and stand back - it will astound you! 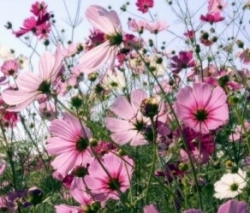 Cosmos is one of the fastest growing and easiest to grow and bloom annual ornamental flowering plant. Common cosmos (cosmos bipinnatus) is a herbaceous plant with delicate fern-like foliage carried in an open and at times sprawling habit. It is native to Central America and Mexico and grown mostly as an annual from seed. Cosmos likes hot, dry conditions and some varieties can attain heights of six feet or more which also makes them ideal as informal background plantings. The abundant, mostly single, daisy like flowers are 2 to 4 inch across and come in a color range from white through magenta. Cosmos sulphureus, also known as the orange cosmos produces creamy yellow to dark vivid orange blossoms. Their foliage is somewhat coarser than common cosmos. Flowers are carried high on long thin stems which are well suited for cutting. If you take the time to deadhead, flowers will appear continuously all through the growing season and well into the late autumn. If plants are really growing tall after their first bloom, cut them down by about half and you will get another burst of bloom in about a month. Sow cosmos seed early in spring. In cooler areas, sow indoors in flats or cells about a month before last frost. Keep in high light with adequate moisture until ready to plant out. They will transplant easily. If they have become somewhat leggy, you can safely plant them deeper - at least up to their initial pair of leaves. In warm more southern areas, sow seed directly into the ground. Prepare the soil by first watering the planting area thoroughly. The next day, use a rake to roughen up the surface and broadcast the seed. Scatter about 1/4 to 1/2 inch of topsoil over the seeds and tamp down with a board or by simply walking over the seeded area. Give it another scant spray of water. Keep the area reasonably moist, but don't over water, until seedlings emerge and are about 2 inches tall. These are easy to identify because of their fern-like foliage. If you have groups growing very close together, thin to leave the strongest ones to stand about 8 inches apart. You can try to transplant some (along with a good portion of surrounding soil) to barren spots and water them in. After that, let nature take over. Your cosmos plants will take off and grow at an astonishing speed without any more attendance unless there is no rainfall. If there is a drought or the weather is unusually warm and windy, examine the plants and give them a good soaking if the foliage appears wilted. The only thing you can do wrong growing annual cosmos is to treat it too well. Too much fertilizer will promote lush growth at the expense of flowers. Cosmos plants are self seeding, so chances are that once you have an established colony of cosmos, they will reappear every year without intervention. 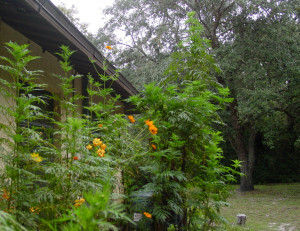 Here is a photo of orange cosmos growing along the foundation planting area of our home. As you can see, they have grown taller than the house! These came up as volunteers from a planting the previous year. They were not thinned or mulched and were given no fertilizer. We have done nothing for them except water when they were showing signs of wilt. Photo was taken in early October. They are just now beginning to bloom with loads of buds in the developing stage. Hummingbirds visit them every day.